A Pair So Famous | Theater | Style Weekly - Richmond, VA local news, arts, and events. Richmond Shakespeare&apos;s “Antony and Cleopatra” needs some work. It&apos;s the tale of a romance that destroyed an empire. 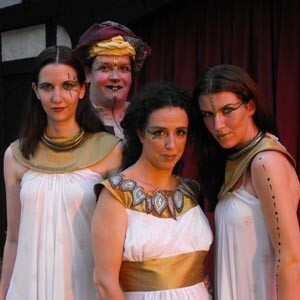 But for a play that explores how passion can distort a person&apos;s judgment, Richmond Shakespeare&apos;s “Antony and Cleopatra” suffers from a lack of that emotion. Based primarily on Plutarch&apos;s “Life of Marcus Antonius,” William Shakespeare&apos;s play begins after the founding of the Second Triumvirate. After years of turmoil, bloodshed and civil war, the tale chronicles the last decade of Marc Antony&apos;s life and the further backstabbing and treachery that followed. Sadly, this performance lacks the power to sell that weighty story. There&apos;s no love — and little lust — between David Bridgewater&apos;s Antony and Shirley Kagan&apos;s Cleopatra. Bridgewater&apos;s portrayal captures much of Antony&apos;s sense of duty to Rome, but he seems to care little for Cleopatra, and Kagan&apos;s Cleopatra is bored and whiny. Cleopatra is supposed to be a diva, and her passion and anger should spout at a moment&apos;s notice. Given that Cleopatra is one of Shakespeare&apos;s most dynamic woman&apos;s roles, the result is disappointing. Elsewhere in the cast, Zach Brown&apos;s dark Enobarbus and Sarah Jamillah Johnson&apos;s Charmian shine in their spots, but the rest of the show still needs work. With all the bouncing back and forth between Alexandria, Rome and elsewhere, the staging demands are more difficult than most Shakespeare plays. The show struggles to meet these challenges, most evident in the fourth act on Cleopatra&apos;s Monument. The most dramatic scene in the play loses its power because it takes place far upstage on a raised platform. Not only does the distance of the platform from the seats make it more difficult for the audience to connect, but a metal bar and its support wire partially obscure the audience&apos;s view. Richmond Shakespeare&apos;s “Antony and Cleopatra” runs Thursday through Sunday nights until Aug. 1 at Agecroft Hall. Tickets are $13-$27. For information visit richmondshakespeare.com or call 866- 227-3849.